Audi’s A7 didn’t start the coupe-like sedan trend, but with its muscular proportions, beautiful surfacing and Kammback rear it managed to make us almost forget the segment’s progenitor, the Mercedes-Benz CLS. Now the handsome four-door is about to undergo a complete redesign. Prototypes for the new A7 have been out and about for some months. Today, though, we have our first look at a prototype for the sporty S7. 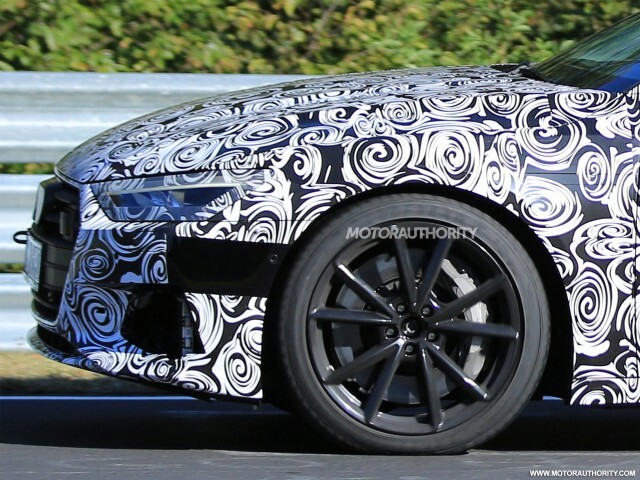 We know this prototype is for the S7 because of its massive wheels and brakes. A close up on the front wheel reveals a brake disc that fills the entirety of the wheel housing and a caliper that almost spans the diameter. There are also four exhaust tips at the rear, a signature design trait for Audi’s S cars. It’s not clear what engine is lurking beneath the hood but a safe bet is the Volkswagen Group’s new twin-turbocharged 2.9-liter V-6 that made its debut in the 2017 Porsche Panamera 4S, where it delivers a healthy 440 horsepower. Expect a similar output in the new S7. V-8 fans can look forward to a new RS 7. This one should feature a version of the VW Group’s twin-turbocharged 4.0-liter V-8 that made its debut in the 2017 Panamera Turbo, possibly with an electric compressor thrown in to reduce lag. The technology made its debut in the 2017 SQ7 TDI sold overseas. 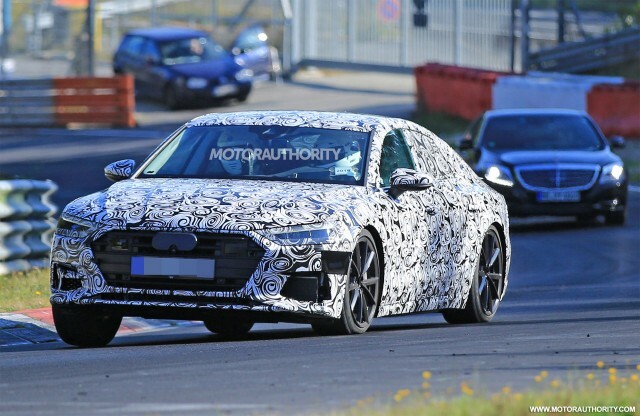 Though it’s yet to be confirmed, Audi may also be preparing an electric A7, as suggested by a prototype devoid of any visible exhaust tips. Audi CEO Rupert Stadler in July confirmed that by 2020 two more electric Audis will join the automaker’s Q6 e-tron debuting in 2018. One could certainly be an A7 e-tron. Look for the new A7 and S7 to land in showrooms in 2018. They should arrive as 2019 models.